It’s 2012 and it looks like this is the right time to have an action figure inspired from a person who rose to fame on the almighty Internet. Remember that 5 years old meme with the “bare-chested man wearing a Thor’s hammer pendant”? In YouTube years that’s ancient, right? Forget about Action Man, dinosaurs, cowboys and Indians, forget about Barbie’s Ken, for that matter and forget about the Ninja Turtles. 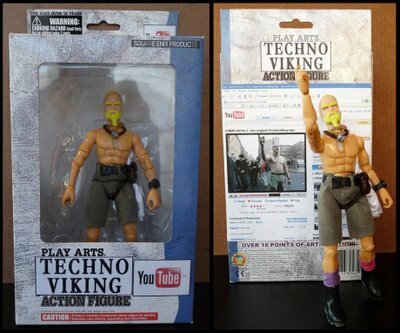 Techno Viking is the best modern badass there is and he’s also a role model of Northern descent for all humanity. Internet fame is finally starting to pay off, isn’t it? Although there is no official information of the toy actually being in stock anywhere, it looks like the idea is appreciated. So I guess even if it were false for now, it might get real due to its potential success. And if you thought Toy Story 3 was good, I guess when the time comes for a third sequel, they’ll know what to do. And it should be absolutely Techno! Picture and featured image from Techno Viking’s Facebook page.